Moments of bliss are relatively rare in movies, and fleeting when they do happen. It can’t be otherwise, really. After all, a happy character is a boring character, devoid of conflict; the very nature of drama (in the broadest sense of the word, encompassing comedy) demands that something must immediately go wrong. If you happen upon an unknown film at random on TV and the star seems ecstatic, it’s a fair guess that you’ve stumbled into the story at the very beginning or the very end. But it’s those occasional blissful interludes in the middle that can be the most transporting, even if they’re obviously a brief oasis in the midst of a giant shitstorm. One of the glories of the musical as a genre was that it served up such interludes every 10 or so minutes, and even “ordinary” movies frequently have musical numbers of a sort embedded somewhere, even if it’s just Tom Cruise dancing to Bob Seger in his underwear or what have you. The effect can be accomplished without a beat of any kind, though. One of the giddiest and oddest bliss-outs I know occurs roughly two-thirds of the way into Jonathan Demme’s Something Wild, and is notable for taking place at the moment when its hero, played by Jeff Daniels, is arguably at the lowest point of his entire life. Having met and fallen for Melanie Griffith’s kooky, impulsive free spirit in the opening scene, he’s now run smack into her psychopathic estranged husband (Ray Liotta), emerging from their contretemps with a broken nose and strict orders to forget about Griffith and return to his safe, contented life in the suburbs. Instead, he opts to follow Griffith and Liotta as they drive (for no apparent reason) from New Jersey to Virginia, trying to formulate a rescue mission. First, however, he’s gonna need to get some gas, and perhaps a few other incidental items at the mini-mart. You know, since he’s there anyway. Not having actually seen Something Wild for a bunch of years, I’d remembered this scene as being uproariously funny, which it really isn’t. 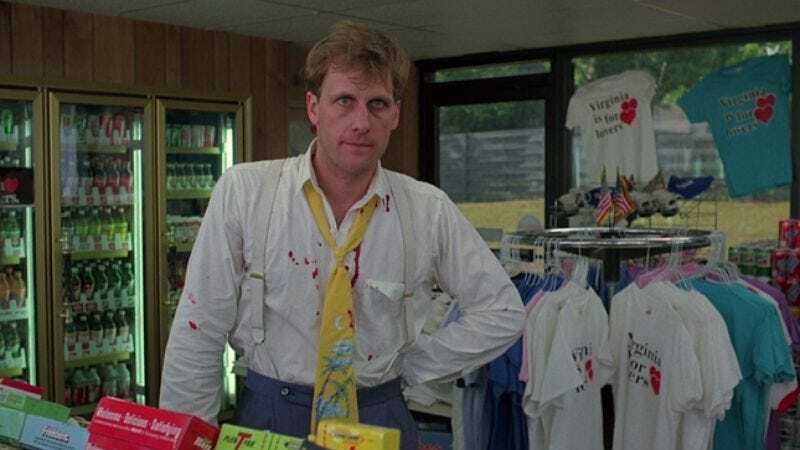 But it still makes me unduly happy, and there’s something very apropos (and very Demme) about the spectacle of a man suddenly realizing his options in the middle of a gas-station convenience store. Daniels nicely undersells the epiphany in order to play it as comedy, but you can still clearly see him being liberated in real time, taking on an entirely new identity via this sad-tourist wardrobe. (Never having been to Virginia, I’d always assumed Demme’s art department had invented all the tackiness; turns out “for lovers” is not only a genuine state slogan, but also was possibly the inspiration for “I [Heart] New York.”) In the space of just a few seconds, he goes from a guy using a location as a stakeout to a guy who wants a pair of shorts so badly that he’ll drop his pants right there in the middle of the store. In another quintessential Demme bit, the disrobing barely fazes Nelson, the gas-station attendant, who merely instructs Daniels to “attempt to be cool.” (Nelson is played by Steve Scales, a non-actor—pretty obviously, though not in a distracting way—who can also be seen grinning like a maniac as the percussionist for Talking Heads in Stop Making Sense.) In a Demme picture, only a stone psychopath like Liotta would dream of standing between a man and his goofy attempt at self-realization, so Nelson is an endless source of cheerful affirmation. At the same time, though, it’s not as if he doesn’t recognize an opportunity for profit when he sees one, suggesting shorts when Daniels asks about trousers and then upselling a pair of socks to boot. That only makes it that much more heartwarming when he insists that Daniels stick with the ridiculous sunglasses he’s already wearing (which Daniels inherited from Griffith earlier in the film). That mix of mercenary and compassionate instincts is Demme in a nutshell. As is the presence of four teenage rappers performing just outside the store. (Did I say “without a beat of any kind”? I stand corrected.) One of the many things I treasure about Demme’s early films—and which I find sadly lacking in most of the work he’s done since winning the Oscar for Silence Of The Lambs—is the sense he provides of a teeming world that exists beyond the margins of the story he’s telling. Rather than a parade of lifeless extras who offer nothing but verisimilitude (in the sense that you’d wonder what the hell was up if the streets were all empty), Demme tends to find people who seem as if they could potentially spin off an entire movie of their own. I can easily imagine a black version of Linklater and Bogosian’s subUrbia starring these guys. Demme even has one of them give Daniels a friendly wave as he exits the store, just to affirm the connection; the scene dissolves on their bouncing interplay. In one sense, they’re mere “background action,” but remove them and the scene loses something essential. On the other hand, I must confess that I don’t necessarily know what would be lost if there weren’t a dude in a Confederate uniform shopping beside Daniels. Not sure how I never noticed him before, as I’ve seen the film at least half a dozen times (though, again, not in many years). In fact, I had to go back and rewind twice to make sure I wasn’t imagining him, so briefly is he visible. But it’s not random: If you look carefully at the establishing shot of the gas station, as Daniels pulls in, you can see a Civil War cannon sitting on a trailer attached to another vehicle. (It’s amazing the details you don’t notice unless you’re actively looking for them.) Did Demme feel like it wouldn’t really be the South without re-enactors? If this were, say, an Albert Brooks movie, I’d assume it was a snide joke—but in that scenario, it would also likely be more prominent. That I never even noticed until now makes it seem not just innocuous but almost accidental, as if real Civil War buffs wandered near the set and got drafted into service just for the hell of it. Which actually sounds very much like something Demme would have done back then, come to think of it. From this point on, Something Wild heads down an increasingly dark road, reclaiming its funky groove only when Sister Carol appears to rap over the closing credits. Daniels pays a price for his sudden taste of freedom. But you can see in these few ebullient minutes, before he even gets the girl—when he's doing nothing more momentous than charging a bunch of useless roadside crap to his credit card—that it'll be worth it.